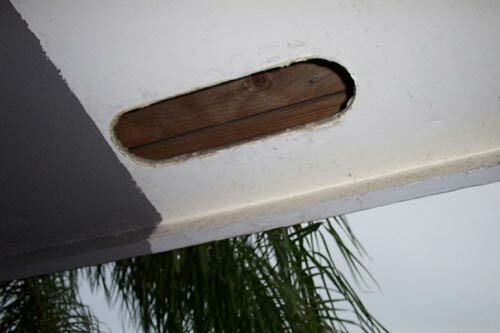 1) Raccoons were crawling in and out of this wide open hole in the soffit. 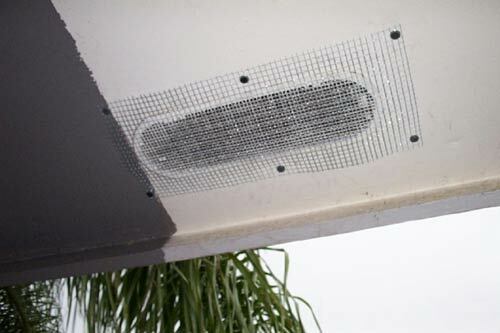 2) I cover the hole with heavy gauge wire and bolt it down tight. I have a raccoon in my roof who do I call - Thankfully, you don?t have to handle the issue of a raccoon in your roof by yourself. Most of the time a raccoon in the roof will have gotten into the attic as well, and homeowners that like to take things into their own hands will be able to catch the critter a little easier if this is the scenario, if they can crawl through the attic and find and remove the litter of baby raccoons first. But sometimes the raccoons are only in the roof and are not accessible through any type of crawlspace. An expert will come in and check the roof, looking for the opening the adult is using. Because it is not always possible to scare the raccoon out of the hole and into a cage trap, the professional wildlife remover will sometimes secure a cage trap directly in front of or next to the opening. The trap will be baited with a marshmallow or bread, or better yet, the live baby raccoons removed from the attic. Using meat as bait will draw in other kinds of animals that might cause more trouble than they are worth, so be careful when trapping. Finding that special someone to call for help can be easy if you know what type of service you should be looking for. Look for a professional that offers humane location and removal of all the raccoons. This person will also offer repairs for any holes that have to be made to remove babies. A good expert will take the time to go over your home and property and point out areas for pest prevention improvements.